Pad Thai (or Phad Thai) has been one of my favourite dishes for a while now. Apparently, it’s also one of the most popular Thai dishes outside Thailand so I’m hoping this simple recipe will be a welcome addition to the blog. Pad Thai is one of these dishes that is not that difficult to veganise. I used a colourful array of crunchy veg in my version, but golden-fried tofu cubes would be great addition too. The only reason I did not include tofu is that I simply ran out. The most tricky thing to replace is the fish sauce. This ubiquitous Thai condiment gives this and other Thai dishes their rounded flavour. If there is a will there is a way though. You can either buy a non fish-based fish sauce or simply prepare your own by infusing soy sauce (or tamari) with a bit of seaweed and dried mushrooms. If it sounds like too much effort and you’re only after a quick lunch, just use a straight soy sauce instead…You’ll still be licking your lips after, promise! PS: If you make this vegan pad thai, don’t forget to tag me on Instagram as @lazycatkitchen and use the #lazycatkitchen hashtag. I love seeing your takes on my recipes! Prepare rice noodles according to the instructions on the packet, but do not cook them fully as you’ll give them another minute or two in the wok after. After you immerse them in soaking water, lift the lid and give the noodles a good stir to prevent them from clumping together and sticking to the bottom of the pot. Give them another good stir half way through the soaking time. Once the time is up, drain the noodles and set aside. You may want to stir a little bit of oil through them to prevent them from sticking together but I do not find this necessary. Mix all the sauce ingredients together in a small bowl. If you are using a shop-bought tamarind puree / paste, go easy on it at first as it is apparently more concentrated (and therefore more sour) than if you make your paste from a tamarind block (see notes) yourself. 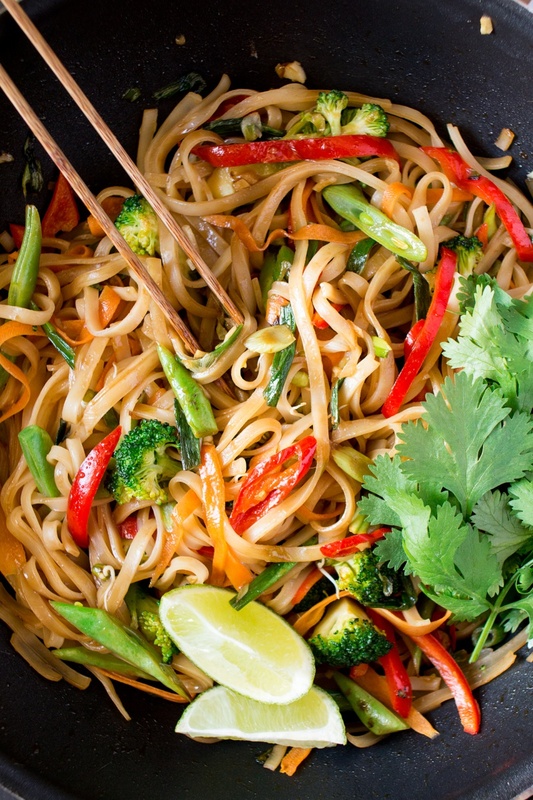 Heat up a wok or a large frying pan. Pour 1 tbsp of oil and heat it up until almost smoking. Add spring onions, garlic and chilli. Stir-fry (stirring constantly) until spring onions soften and garlic becomes fragrant. Transfer to a separate plate, leaving as much oil in the wok as you can. Heat up another tablespoon of oil in the same wok – no need to wash it. Start adding prepared veggies in the following order (leaving a minute or two between each addition): broccoli, peas, red pepper and carrot ribbons. Stir-fry until cooked yet still crunchy. Transfer all vegetables to a big plate and pour the sauce to the bottom of the wok. Add in noodles – they may have clumped together a little, but the sauce and heat of the work will separate them again. Add spring onions, chilli, garlic and stir-fried veg back to the wok. Mix everything well and let it warm up, stirring the whole time, for a minute or two. Divide between two plates, sprinkle with sprouts and crushed peanuts. Serve with lime wedges on the side. *To make a tamarind sauce, chop 200 g / 7 oz of seedless tamarind block roughly and place in a small bowl. Cover with 500 ml / 2 cup of boiling water and set aside for 20 minutes to allow it to soften. Once softened, place in a blender and blend until smooth. Pass it through the sieve to get rid of any leftover seeds. Store in a sterilised jar for 1-2 weeks (due to a high water content in may get mouldy if stored for much longer). **I made my fish sauce using a recipe from this amazing vegan cookbook. It’s basically tamari or soy sauce simmered with generous amount of seaweed, garlic, black peppercorns and a dried shiitake mushroom. You could also use this recipe. 0 Response to "VEGAN PAD THAI"